A lot of research has been devoted to the problem of defining and constructing signature schemes with various delegation properties. They mostly fit into two families. On the one hand, there are signature schemes that allow the delegation of signing rights, such as (hierarchical) identity-based signatures, attribute-based signatures, functional signatures, etc. On the other hand, there are malleable signature schemes, which make it possible to derive, from a signature on some message, new signatures on related messages without owning the secret key. This includes redactable signatures, set-homomorphic signatures, signatures on formulas of propositional logic, etc. 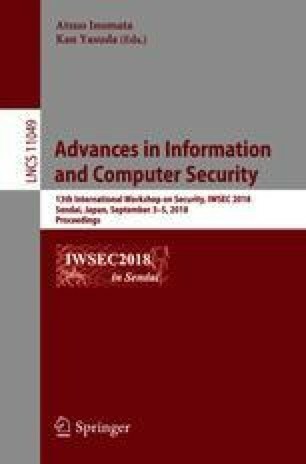 In this paper, we set out to unify those various delegatable signatures in a new primitive called universal witness signatures (UWS), which subsumes previous schemes into a simple and easy to use definition, and captures in some sense the most general notion of (unary) delegation. We also give several constructions based on a range of cryptographic assumptions (from one-way functions alone to SNARKs and obfuscation) and achieving various levels of security, privacy and succinctness.